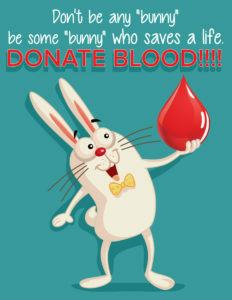 Don’t just be any “bunny.” Be some “bunny” who saves a life! Donate blood Wednesday, April 3, in the Black Box Theatre. We will have free food for those who donate and you get to pick an Easter egg with a mystery prize! We also will be giving away $5 Walmart gift cards to those who register prior to the blood drive and come to donate! Next PostNext Hagerman-Thompson Staff Excellence Award, now accepting nominations!